Paul Chambers, bass; Albert Heath, drums. It should be immediately evident from this LP that Jimmy Heath possesses a large handful of attributes of major jazz value: he has a full, deep, compelling sound and a fertile imagination; his playing really swings; and he is a jazz composer of considerable vigor and freshness. And, although his will undoubtedly be a new name to many, Heath is also a thoroughly experienced musician, who has been associated with Miles Davis, Dizzy Gillespie and many other headliners. Since this is a time in which words like "funky" and "soul" seem to be consistently over-used, it may be dangerous to ring them into a description of the mood and quite a few of the tunes selected for this record (particularly his own The Thumper and For Minors Only, and the Wynton Kelly blues, Who Needs It?) seem to demand the use of precisely those words. It is important, therefore, to distinguish between the genuine article and the excess of some who appear to think that anything goes as long as it seems to sound blues-y and church-y. The difference lies in the fact that musicians like Heath and his colleagues here play with "soul" simply because that's the way they feel this music, the way they always have. Jimmy, having been away from the main jazz scene for some time prior to the Summer of 1959, had expressed concern that he might not be fully "up to date." Quite to the contrary, it would seem that this has enabled him to avoid some of the recent by-ways and turnings and to remain in touch with fundamentals. 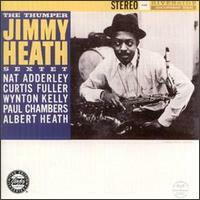 I think you'll find further confirmation of the true soulfulness of Jimmy Heath in the way he approaches a ballad. Neither the sexted arrangement of For All We Know nor Duke Ellington's Don't You Know I Care (played with just rhythm-section backing) is treated in a "pretty" or maudlin way. Both are atacked with real passion and great depth. Working closely with Jimmy to produce this effect is an extremely impressive group. Cornetist Nat Adderley was operating with the added emotional advantage of having just been re-united with his brother Cannonball [Adderley] in an exciting new band; Curtis Fuller, outstanding among young trombonists, has been featured since mid-1959 with the Benny Golson - Art Farmer Jazztet; both Wynton Kelly and Paul Chambers are key members of the Miles Davis Group; Albert Heath, regularly J.J. Johnson's drummer, has of course special incentive on this album. Incidentally, the title of one orignal here, Two Tees, is derived from Albert's nickname, "Tootie." And while on the subject, note that Newkeep is taken from the Heath's mother's version of the last name of this writer. There have fairly recently appeared such mightily impressive Philadelphia-raised tenor men as John Coltrane and Benny Golson. And it is about as certain as anything can be in the unpredictable world of jazz that this first album by Philadelphian Jimmy Heath will very quickly add another name to the list of today's foremost tenor saxes.